The transcript is divided into sections, each with a timestamp that shows how far into the recording that portion of the text was recorded. You can edit the text to more accurately capture the words, or to add capitalization and punctuation, which are not captured by the transcript. You can search for text within the transcription and you can search for transcribed recordings that include the text you are searching for. Audio Transcripts are saved in .vtt format. If you download the .vtt file, you can open it with a text editor such as Microsoft Word, Text Edit, or other common word processing applications. Navigate to the Cloud recording option on the Recording tab and verify that the setting is enabled. 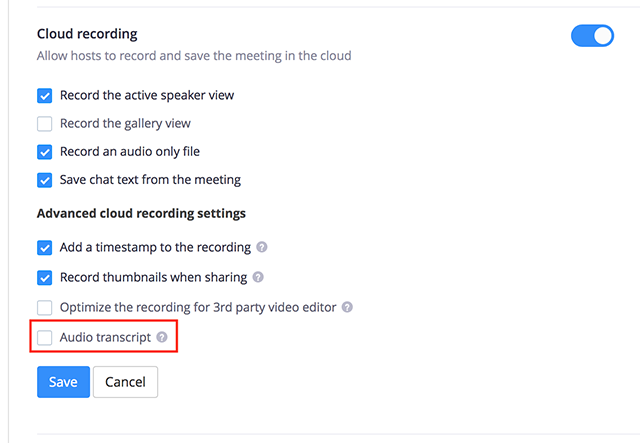 In the Advanced cloud recording settings, click the Audio Transcript checkbox to enable it, then click Save to confirm the change. Note: If you want to make this setting mandatory for all users in your account, click the lock icon, and then click Lock to confirm the setting. Sign into the Zoom web portal and navigate to Group Management from the User Management menu. Click the desired Group Name from the list, then click the Settings tab. Navigate to the Cloud recording option on the Recording tab and verify that it is enabled. Note: If you want to make this setting mandatory for all users in this group, click the lock icon, and then click Lock to confirm the setting. Start a meeting or webinar. Click the Record button and choose Record to the Cloud. After the meeting ends, you will receive an email that lets you know that your cloud recording is available. A short time later, you also receive a separate email letting you know that the audio transcript for the recording is available. These emails include links to view your recordings and transcript. 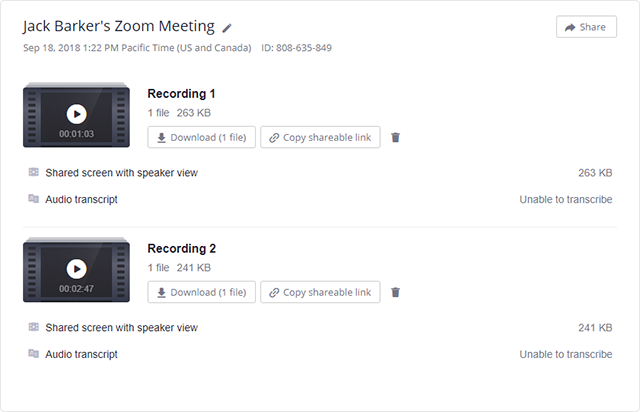 Click the link in the email OR navigate to the My Recordings page on the Zoom web portal and click the name of the recorded meeting. Click the Audio Only m4a file, or the Recording or Gallery View mp4 file, if available. The text of the transcript displays on the right-hand side of the file. Navigate to the Audio Transcript panel on the right and click the pencil icon next to the phrase you want to edit. Make any changes to the text, then click Save. The updated version of the text is displayed when you play the audio or video file. Open the audio or video file from My Recordings. Click the CC icon at the bottom right of the screen. 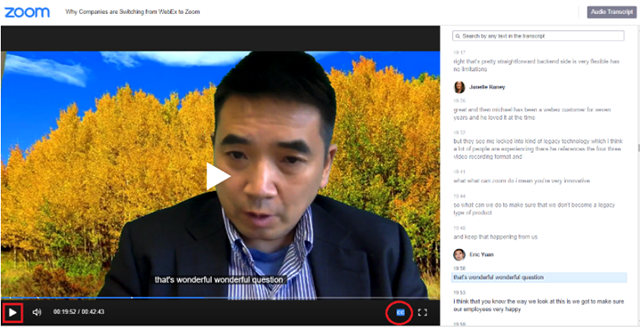 Note: The text displays on top of the video, similar to closed captioning. In the Search by list, choose Keyword. Type a word or phrase in the text entry box, then click Search. Note: This shows the list of meetings that includes the keyword in the transcript. Click the applicable meeting to view the transcript. 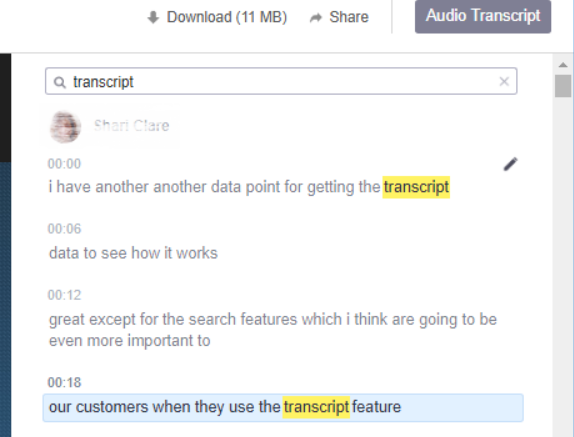 Navigate to the Audio Transcript panel on the right and type the keyword into the search box at the top. All instances of the keyword are highlighted.